Superman is amazed when a Kryptonian craft lands in the middle of Metropolis. Inside is a Kryptonian boy, a child with all of Superman’s powers. Superman is determined to protect the child and raise him as his own but the authorities are concerned and no one is really sure where this incredibly powerful being came from. Superman’s character is often known as the Last Son of Krypton. Many see it as integral to his character that he is the last survivor of his species, the only remaining member of a long dead race. However, with comics it often isn’t that simple. Over the years, characters have been introduced which also come from Superman’s dead planet; Super Girl, Krypto the Super Dog, General Zod, the people of Kandor – the list goes on. Thus there have been many stories which show Superman confronting these figures from his planet’s past which sometimes results in amiable ends or, in many cases, massive fights. 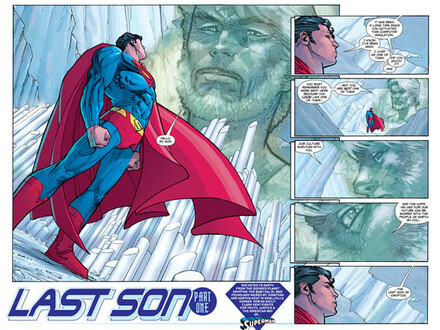 Last Son takes a different and fascinating approach; it makes Superman not only have to battle Kryptonians but also come to terms with fatherhood. The plot revolves around Superman attempting to save a young Kryptonian child from being taken away by the US armed forces to be tested. Throughout the novel, Superman continually shows concern and downright rage at the idea of the child being seen as a weapon or US army property. This deep sense of morality is one of Superman’s key features as is his entrenched sense of patriotism. Of course, Superman’s American persona is one of his major problems – it makes him seem like a simple goon of the state in the same way Captain America is seen as merely a patriotic robot. In this comic, Superman defies the stereotypical label that is often attached to him. He is patriotic, certainly, but he does not let his devotion to America get in the way of his devotion to justice. When he believes that the army are attempting to seize one of his own he reacts – in the same way a father would – with anger, shock and horror. Superman can see how a manipulation of his own powers in someone younger could lead to a disastrous situation and thus seeks to avoid it. Geoff Johns and Richard Donner’s clear distinction between patriotism and totalitarianism is shown by Superman’s independence of mind. This is further reflected when General Zod appears. Zod represents the flipside of Superman, something Johns and Donner play on nicely. He believes in submission to the state, the state in the case being Zod’s will. He sees freedom of thought as something unorthodox. His attempts to crush Superman and the Kryptonian boy’s will and his subsequent defeat at the hands of Superman clearly show that bravery is found in standing out and being different, something that Superman also represents. The artwork by Adam Kubert is stunning. While the design of Zod may not be the best, his take on Superman and Lois Lane is incredible. Kubert gives a new breath of life to the characters and make Metropolis seem like a really buzzing city. Last Son is a fascinating comic with some interesting ideas about truth, justice and the American way. Superman’s popularity in recent times may have declined as patriotic Americans become disillusioned with their country but Last Son rectifies that by showing Superman at his best.